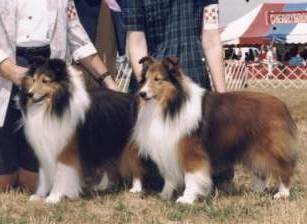 Shelties come in several colors and patterns. 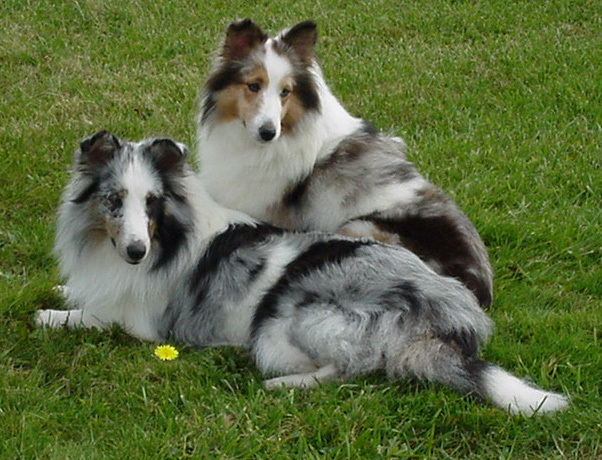 The two primary Sheltie colors are sable and black. All other colors in the breed are determined by other genes acting upon these primary colors. 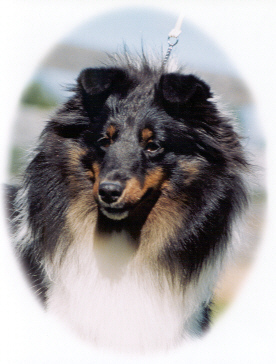 Sue Bowling's Color Genetics page (also some links to pictures of various colors and patterns - note the UKC ALLOWS Color Headed Whites in Conformation, the AKC does NOT). Visit Sue Bowling's Page. 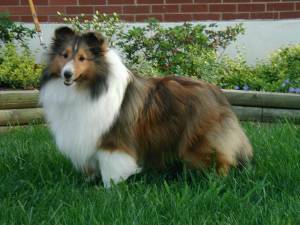 Sable is the dominant color in Shelties. can range in color from a pale gold to reddish to deep mahogany - almost black. Sables will have varying amounts of white and shading. These dogs are both examples of Sable. One is a dark mahogany and one is what is sometimes referred to as a "red" sable. This dog is another example of a sable. 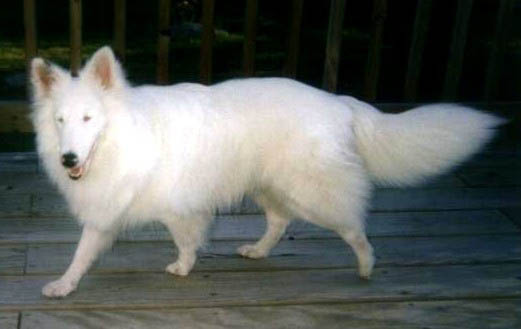 Sable dog can be pure for sable and will only produce sable no matter what bred to (however, the resulting offspring will carry recessive genes from the other parent). Black factored sables carry the recessive black and can produce either tri colors or bi blacks depending on if the black factoring is for tri or sable. However, a black factored sable cannot be both tri and bi factored. 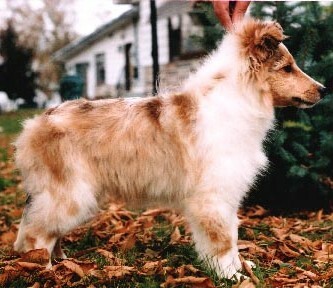 A sable merle is a sable dog with a single merling gene. Like sable, the color can range from pale golden to mahogany with varying amounts of white. 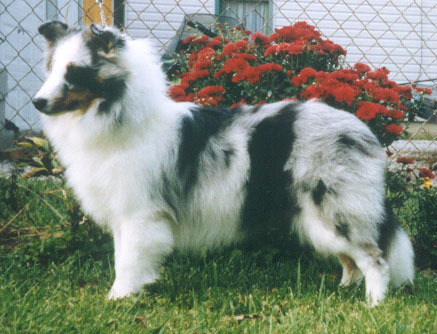 Sable Merles can be achieved by breeding a blue merle to a sable dog or a sable merle to a sable. 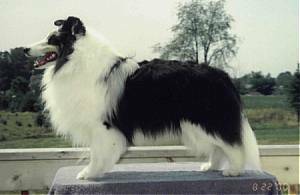 Since it can be difficult to determine if a dog is sable merle or not, using them for breeding should only be done by people knowledgeable of how merling works. When a merle is bred to a merle, there can be devastating results due to the doubling of the merling factor (see Double Merles below). Sable merles should be identified as such on registration papers. This pup from Stonefox is a Sable Merle, if you can see some merling on his back (the black spots). But when they grow up, often it is tough to know if they are merled or not! The puppy all grown up! Black is recessive to Sable. Two black dogs will never produce a sable but two sable dogs that are carrying for black can produce black dogs. 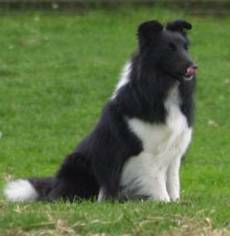 A Tri Color is a Sheltie that is black with varying amounts of white and tan “points.” This girl is from Breakaway Shelties. A black dog with just white is called a bi black, It has no tan and does not carry for tan. Now, if you add a merle gene to a black dog, you get a blue. 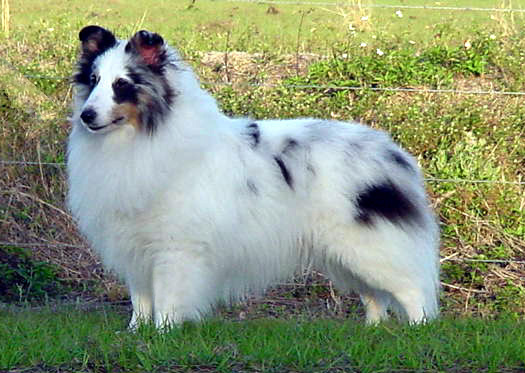 A blue merled dog with tan is known as a Blue Merle. If it has no tan, it is a bi-blue. What do you get when you take a black dog and toss in that partially dominant merle gene? You get a Blue merle or a Bi-Blue. The merling factor dilutes the black out to a gray (ranging from silver to deep "denim") mottled with varying amounts of black. Some dogs have a lot of black in large patches while others have small flecks of it. If there is tan, the dog is a Blue Merle, if there is no tan, the dog is a Bi Blue. This Blue Merle from Premiere is much lighter gray. This boy from Stonefox is a bi blue - note, he has no tan. A Color Headed White is just that - a primarily white dog with a colored head. This can happen when you breed two dogs with white factoring. 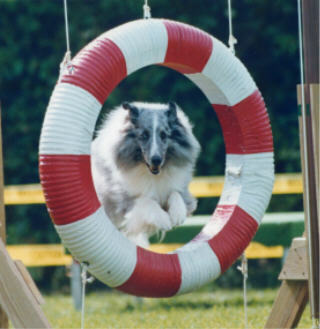 White factoring controls the amount of white you have on a Sheltie. Some dogs are not white factored, others are and yet some have quite a bit of white factoring - the CHW's.. It is just an excess of white and not to be confused with a double merle which can happen when two merles are bred together. Color headed whites should NOT be confused with the double merle. The genetics that create a CHW are different from those which create a Double Merle white. Unlike double merles which have an increased chance of vision and hearing problems, CHWs are perfectly normal. The most favorable pattern in a CHEW is a colored head and a white body. For more on how white factoring works, please click here. 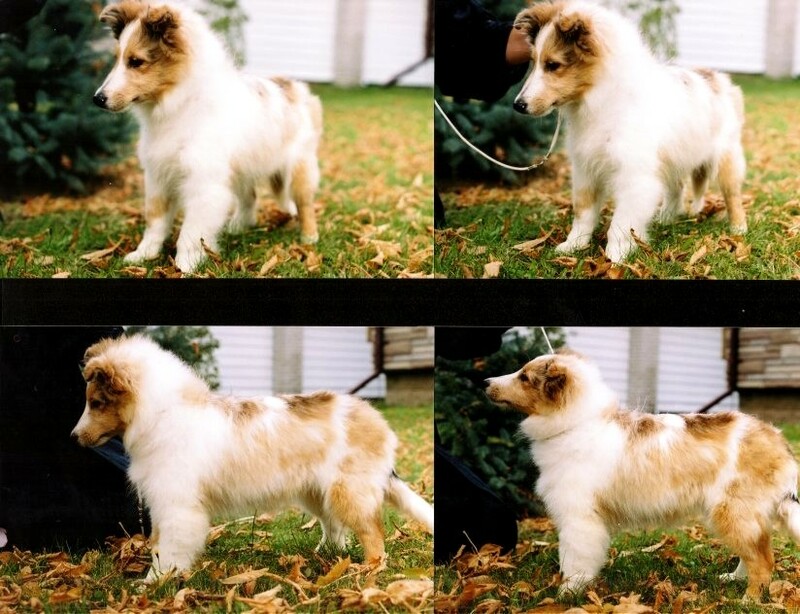 CHWs can come in any Sheltie color - Sable, Sable Merle, Bi Color (blue or black), Tri Color and Blue Merle. They can also come in many patterns. Please click here for examples. This is a Blue Merle CHW. This is Dallas, one of the first CHW Champions in the UKC after the pattern was allowed for competition. 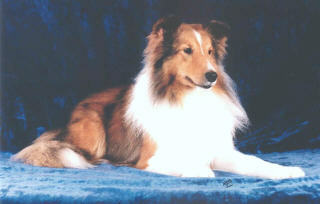 He also is obedience titled and is owned by RySong Shelties. 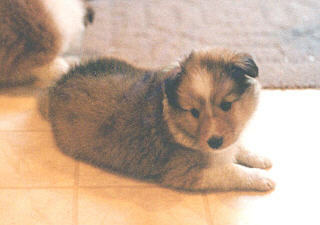 And here is another CHW, also a Blue Merle CHW courtesy of Breakaway Shetland Sheepdogs. Let's take a look at a Sable Merles and Blue Merles next to each other. These pictures are courtesy of Premiere. It is much easier to see the affect of the merling gene on a black dog that it is on a brown! With sable merles, it can be difficult to tell if it is a merle or not. If a sable has a merle parent, assume it is a merle until proven otherwise. Sometimes you can easily tell sable merles, other times they do not look merled. However, with puppies, it can be easier to see the merling before all that coat comes in! Again, the merling gene is partially dominant. All these dogs carry ONE merle gene. If they carried two, they would be considered a double dilute or double merle - the last color segment on this page. This happens when you breed a merle to a merle (sable merle to sable merle, blue merle to blue merle, bi blue to bi blue, sable merle to blue/bi blue, etc). The merling gene is doubled (remember, only one merling gene is needed to create a merle). Some double merles may have normal sight and vision and may have quite a bit of color in their coats, but they are still double merles. Though there are several fabulous double merle sires such as Shadow Hill's Double Trouble (click here for off site picture), double merles have a higher incidence of vision and hearing problems. They are NOT to be confused with a color headed white. Unless you are very familiar with the working's of the merling gene and willing to accept the higher risk of problems with puppies, merle to merle breeding should be avoided. When bred to a non-merled dog, double merles produce normal puppies without hearing or vision problems. For more on merle genetics, please click here. This dog (Mica) lives in California with trainer Nancy Edwards. He has limited sight and hearing. To see pictures of another double merle, please click here.